In a book embedding the vertices of a graph are placed on the “spine” of a “book” and the edges are assigned to “pages” so that edges on the same page do not cross. In the Partitioned 2-page Book Embedding problem egdes are partitioned into two sets E 1 and E 2, the pages are two, the edges of E 1 are assigned to page 1, and the edges of E 2 are assigned to page 2. The problem consists of checking if an ordering of the vertices exists along the spine so that the edges of each page do not cross. Hong and Nagamochi  give an interesting and complex linear time algorithm for tackling Partitioned 2-page Book Embedding based on SPQR-trees. We show an efficient implementation of this algorithm and show its effectiveness by performing a number of experimental tests. Because of the relationships  between Partitioned 2-page Book Embedding and clustered planarity we yield as a side effect an implementation of a clustered planarity testing where the graph has exactly two clusters. 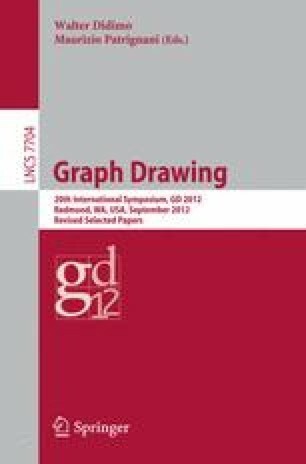 This work was partially supported by the ESF project 10-EuroGIGA-OP-003 GraDR “Graph Drawings and Representations”, by the MIUR of Italy, under project AlgoDEEP, prot. 2008TFBWL4, and by the italian inter-university computing Consortium CASPUR.